Are you alone with a friend and a deck of cards? Want to learn a few fun card games for two players? Well, you've come to the right place. Schnapsen is a fun game for 2 players played with a 20 card deck(some variations have 24 card decks). The cards used are A, K, Q, J, T, (9). It's not a particularly social game, since it involves quite a lot of thinking and a solid memory, but for all of you out there that are looking for something challenging, or just looking for something to outplay your friends in, it's perfect. So learn the rules to Schnapsen! The Bidding War is a simple card game for two players. It's similar to the children's card game War, but it involves a little more skill. That means that, if you play better than your opponent, you can gain an edge on him and beat him more often than not. Learn the rules of the Bidding War! Spit is a classic shedding game; that is, the ultimate goal for the players is to be the first to get rid of all their cards. This is a fast-paced, simple and highly entertaining card game for two people. It’s an ideal game for when you and a friend just want to have a relaxing, good time without too many headscratchers or boring steps getting in the way of it. All you need to play Spit are two decks of standard playing cards and your preferred method of keeping score. No additional resources or expensive decks or boards are at all required to get going and have some fun. Just a small part of what makes this game such a simple and comfortable time! In Spit, each player gets one of the playing decks. Each player then takes the four top cards from their deck and places it in front of them in a row, face up. The deck ranking is straight-forward and logically descending in numerical order from the face cards down: A (high or low), K, Q, J, 10, 9, 8, 7, 6, 5, 4, 3, 2. The rules and mechanics are simple. When both people are ready to play, one of them says “spit” (after all, that charmingly strange name needed to come in to play somehow!) and each player removes the top card from their deck and places it in the center of the table; the two cards will form rows and will be the focus of the action for the rest of the game. There are no turns in Spit and each player makes their moves simultaneously. The players take the cards from their row and place them on top of the center piles. However, a card can only be played if it is one higher or one lower than the card it is played on top of. The suit of the card does not matter. Once a card is played, it can then be replaced in the player’s row by the top card of their deck. Note: Each player can have a maximum of only four cards in their row. Cards can only be played one at a time. If the two players both try to play a card on the same pile, whichever player reached the pile first gets to be the one to play their card. This is probably going to be important to remember; because the game is played simultaneously, the two players are probably going to try to make identical plays fairly frequently. If both players get stuck and can’t play a card, one of them says “spit” again and they place their top deck cards on the piles and the game continues. Whoever gets rid of all their cards (in both their deck and their row) wins the game. If both players exhaust their deck and neither one can win the game, whoever has the fewest cards left in their row wins. Piquet is a two player card game that has been around for over 400 years. It is a trick-taking game and is notable for its distinct Western European flavor and terminology, as well as its unusual deck structure for the cards. This is definitely apparent the minute you start playing: Seemingly every important term has a non-English name! The game is particularly original in that it consists of six deals, which is referred to as a partie. Piquet is unique in that it requires a 32 card deck to play. However, this can be easily achieved with a slight modification of a standard 52 card playing deck. All you need to do is remove all of the 2-6 cards before you start and you’re ready to play! Absolutely no need to go to a store or online to search for an elusive and probably expensive 32 card deck. Piquet has quite an original process for dealing. It begins with either player shuffling the deck, and then cutting the deck for the high card. Whoever has the high card is the winner and chooses who deals first. From there, the cards are reshuffled and twelve are dealt to each player. Eight cards are left over as a talon and placed face-down at the center of the table. The player who does not deal is the elder hand, while the player who deals is the younger hand. This is just a fun term and does not at all need to correspond to the player’s actual ages! If a player is dealt a hand with no face cards, they can immediately call a carte blanche and be given 10 points. The player (and their opponent) then discard their hand face-up and the game goes back to where it was before the carte blanche. The scoring system for Piquet can seem quite intimidating at first, but it’s actually fairly intuitive once you manage to get the hang of it. Basically, each time a player scores points, they’ll announce their running total score for that hand to the other player. Once a hand is completed, the players record their totals and add it to the score for the whole party. The winner is whoever has the highest score at the end of the party. If there is a tie, two more hands are played. If both hands were ties, then the party is called as a draw. The game will also automatically end if a player reaches 100 points; in that case, the player who scored 100 points is declared the winner. The players may want to play another party, in which case, the scores are reset back to 0. Once the game begins, the first step is the exchange. The elder hand goes first in the exchange process. The elder hand discards 1 to 5 cards from their hand (face down) and then draws an equal number of cards from the talon. Then the younger hand exchanges. The younger hand can only exchange between 1 and the number of cards left in the talon, however. Either player must announce if they are discarding less than the maximum. The discarded cards are kept in a pile beside the player who discarded them. If the elder hand discards less than five cards, they can look through the talon while exchanging and the younger hand can then repeat that process. Points: The largest number of cards in a single suit. The player announces the number of cards in that suit and that number is added to the player’s total score. Sequences: When the cards come in a sequence. In order of ascending point count, the sequences are: Tierce (3 cards and 3 points), Quart (4 cards and 4 points), Quint (5 cards and 15 points), Sixième (6 cards and 16 points), Septième (7 cards and 17 points), Huitième (8 cards and 18 points). Sets: Multiple cards of identical rank. There are two types of sets: Quatorze (four of a kind of Aces, any face card, or 10’s; worth 14 points) and Trio (three of a kind of Aces, any face card, or 10’s; worth 3 points). Sets of 7, 8, or 9 are not worth any points. The elder hand will say their best combination in the hand for each category. After each announcement by the elder, the younger can respond either “good” (the younger hand does not have a combination that beats the elder’s), “bad” (the younger hand does have a combination that beats the elder’s), or “equal” (the younger hand has a combination of equal value). In the latter case, neither player will score their combination. In the case of a tie of sequences, the cards can be compared by value and then the player with the higher value will get to score those points. This applies equally well to the other two categories of combinations. Bonus points can also be awarded in two specific scenarios: Repique and pique. The former consists of 60 bonus points awarded if a player scores 30 or more points during declarations before the other player has scored any. The latter consists of 30 bonus points awarded if a player scores 30 or more points during both declarations and play before the other player has scored any. And that’s it for the gameplay of Pique! It might sound complex at first, but after a few hands you will almost certainly get a good grasp of the mechanics and general gameplay. Remember to have fun and try to pick up some neat foreign words in the process! Egyptian Rat Screw is a game based on matching cards and is loosely based on the older card game, Beggar-Thy-Neighbor. One unique aspect that distinguishes it from similar games is that players slap the cards when they form special combinations. It might be important to keep in mind caution while playing; try not to hurt each other (or at least too badly, anyway)! 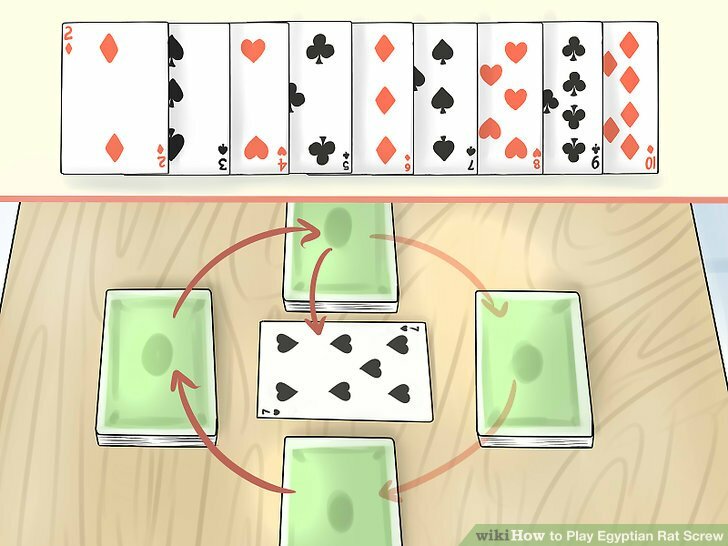 All that is needed to play Egyptian Rat Screw is a standard 52-card playing deck. Again, another refreshing example of the simplicity that often comes with two-player card games. The cards are dealt face down, one at a time, to each player. Then, when the dealer is finished, each player puts their cards into a neat pile in front of them without looking at any of the cards. Either or both players can participate in the shuffling and dealing of the cards; it makes no difference at all. The gameplay for Egyptian Rat Screw is very straightforward. To start, each player takes the top card of their pile and puts it face-up in the middle of the table. If the card that’s played is a number card, the other player puts down a card as well. This will continue until either a face card or an ace is played. Once the initial face card or ace is played, the other player might play a face card or ace, in which case the match will continue. However, if they play a number card, then the first player wins the match and gets all the cards that have been played so far. Then the next match is initiated by the winner of the last one and the same rules regarding the face cards, aces, number cards goes into effect. A face card or ace can be beaten, however, by the slap rule. If a combination that the slap rule applies to is in effect, then whoever slaps the center pile of cards first gets them all. So have fun with your friend, spouse, partner or kid and enjoy your card game for two!